Pre-orders come with a download of the track "Sound of the Rain"
ALAN WATTS IS ONE OF THE MOST IMPORTANT INTERPRETERS OF EASTERN PHILOSOPHY FOR HIS TIME AND OURS. IF HE WERE ALIVE TODAY, HE'D PROBABLY SUBVERT SOCIAL MEDIA IN THE SAME WAY HE HELPED TO REINVENT WESTERN CULTURE IN HIS OWN TIME. ONE DAY, HIS COMPLETE AUDIO RECORDINGS WILL BE OBLIGATORY FOR ANYONE COMING OF AGE IN THE NEW AGE. HIS BOOKS AND RECORDINGS ARE A TREASURED ARTIFACT OF HIS PERVASIVE EFFECT ON OUR TIMES AND A MAGNET FOR ALL THOSE THAT NEARLY KNOW OF HIM AND DEARLY NEED TO. HIS WORDS ARE AS RELEVANT NOW AS THEY WERE THEN. THIS YEAR, WATTS TURNS 100. WE CELEBRATE HIS CENTENNIAL WITH FACE THE FACTS, A FOUR-TRACK EP THAT TAKES THE RECORDINGS OF WATTS’S EARLY SEMINAR SESSIONS AND SETS THEM IN TIME TO ORIGINAL MUSIC. ALAN'S WIT AND WISDOM WERE FIRST BROADCAST ON RADIO STATIONS IN THE BAY AREA IN THE LATE ’50S AND SOON SPREAD ACROSS AMERICA THROUGH PUBLIC TALKS, TAPE RECORDINGS, BOOKS, AND ON SCREEN. ON HIS PORTABLE TAPE DECK, ALAN’S SON MARK WATTS CAPTURED HUNDREDS OF HOURS OF HIS FATHER’S SEMINAR SESSIONS. YEARS LATER HE DUG UP THESE RECORDINGS AND DIGITALLY REMASTERED SELECT GEMS FOR THE SERIES "THE ESSENTIAL ALAN WATTS" IN THE MID-’90S. 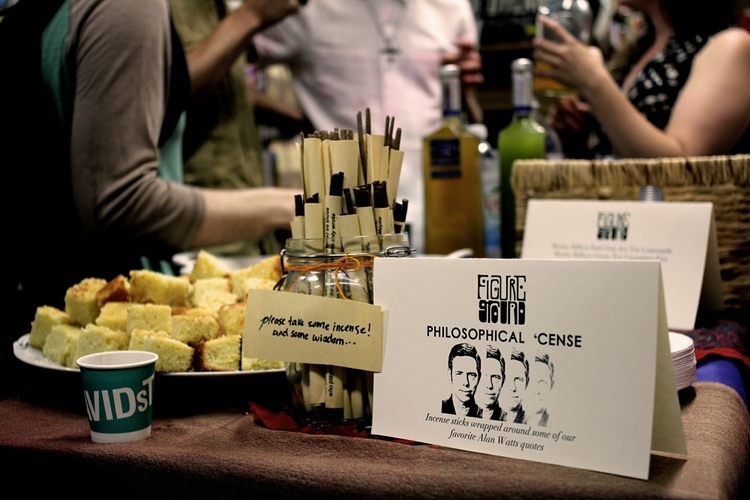 This is Alan Watts in the most informal of settings. He’s relaxed, candid, and spontaneous, and it feels as if you’re right there with him in his living room. His spirit comes through in these psychedelic Californian ruminations, intriguing incantations, and compelling thoughts on existence. It’s a trip. 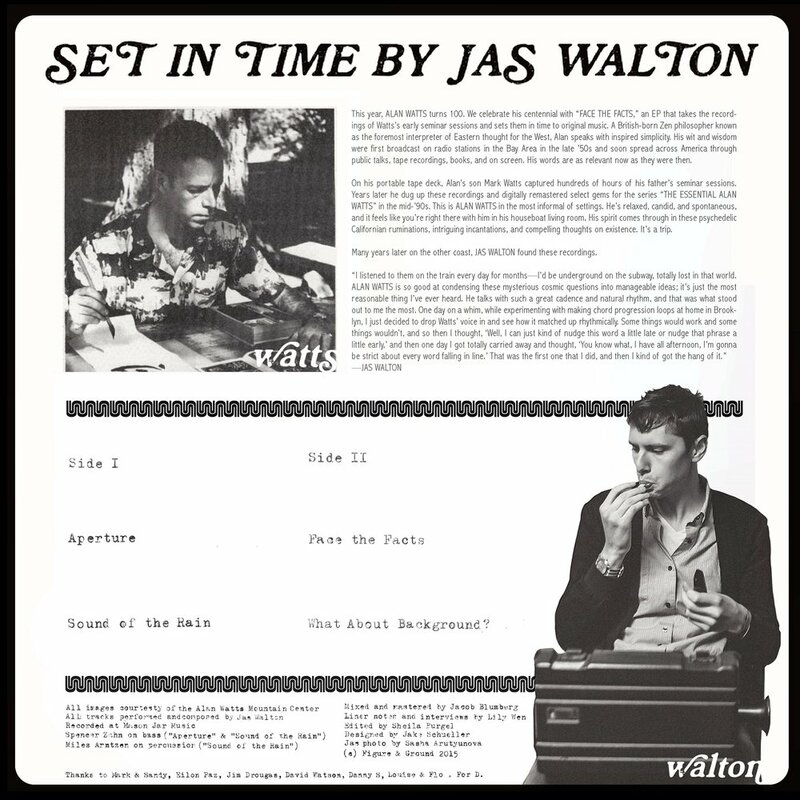 A decade later, New York-based musician Jas Walton found these recordings. In collaboration with the Alan Watts Audio Archive—co-curated by Mark and Henry ‘Sandy’ Jacobs, who produced Alan Watts’s early psychedelic LPs (including "This is IT")—Face the Facts includes an eight-page booklet with images and interviews. As well as rare archival photos dug up by Mark, the booklet features in-depth conversations with him about his father’s public-speaking career and with Sandy about the early recording sessions and the explosive San Francisco cultural scene of the late ’50s and early ’60s.